Dozens of Israeli soldiers invaded, on Wednesday at dawn, Deir Abu Mashal village, northwest of the central West Bank city of Ramallah, and abducted eleven Palestinians, after storming their homes and ransacking them. 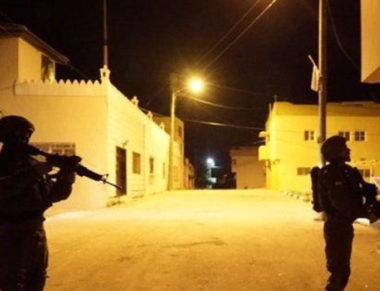 The soldiers also abducted two Palestinians in Jenin refugee camp, in northern West Bank. Media sources in Ramallah said the soldiers carried out very violent invasions and searches of homes in Deir Abu Mashal, and distributed leaflets threatening more collective punishment if the youngsters do not stop protesting. During the invasions into the homes, the soldiers abducted Yousef Nathmi Ata, Adel Haitham Ata, Akram Fateh Zahran, Mansour Ata, Ahmad al-Maken Ata, Mohammad Ahmad al-Maken, Bara’ Thieb al-Hind, Asmar Jihad Abu Yassin and Ali Rassem Barghouthi. The soldiers also abducted Mahmoud Nafe’ and Mohammad Rashad but released them a few hours later. In addition, the army summoned for interrogation three Palestinians, identified as Rafat Zaki Ata, Mohammad Ziad Taha and Hazem Mohammad Taha. Furthermore, the soldiers invaded Jenin refugee camp, in the northern West Bank city of Jenin, searched many homes and abducted two Palestinians. The abducted residents are a former political prisoner, identified as Qasam Mohammad Jabarin, in addition to Sultan Moayyad al-‘Amer.